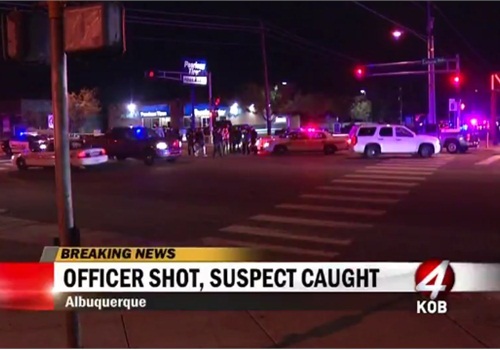 Albuquerque police say an officer who was shot near a Walgreens store in the southeast side of the city Wednesday night is in critical, but stable, condition. The eight-year veteran of APD underwent two surgeries at UNM Hospital overnight. The department has not released his name to make sure all family members and close friends can be notified first, KOB TV reports. The officer was shot around 7:45 p.m. at the Walgreens at Central Avenue and Eubank Boulevard. The suspect, identified as 34-year-old Davon Lymon, was captured just after midnight Thursday, according to APD. During a 1:30 a.m. news conference, Albuquerque Police Chief Gorden Eden said a law enforcement helicopter located Lymon hiding in a yard in the neighborhood north of where the shooting occurred. Eden said Lymon wouldn't leave the yard, so a K-9 was used to take him into custody.